It's Groundhog Day today, kiddies! Are we doomed with six more (DREADED) weeks of this frozen hell they call Winter, or will it all be over lickety split? As per the wacky North American tradition, Canada's Wiarton Willie, and his American cousin, Punxsutawney Phil, will be dragged out of their toasty burrows by some scary dudes wearing top hats (!?) in the hopes of forecasting an early Spring. "Legend" has it that if they see their shadows & high-tail it back inside their warm dens, we're punished with six more long, draggy weeks of Winter. Failing that, if no shadow greets the rodents, Spring's just around the corner -- supposedly. Year in, year out Willie & Phil get centre stage... and this year, they're not the only ones making a well-timed February comeback. February's Blizzard of the Month is one worth repeating. Yup, IT'S BACK!!!! 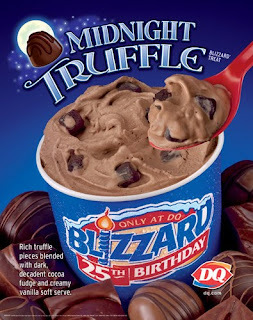 Celebrated all month long *last April*, the Midnight Truffle Blizzard from Dairy Queen is making a comeback in grand style! Dark chocolate truffles... cocoa fudge! Welcome back, dear old friend! At this point I don't even care if Spring is delayed... with this Blizzard of the Month treat, February can drag on and on and I won't complain one bit! Don't be surprised if after all their weather forecasting festivities Willie and Phil make a run for the nearest Dairy Queen today -- can't say that I blame them!